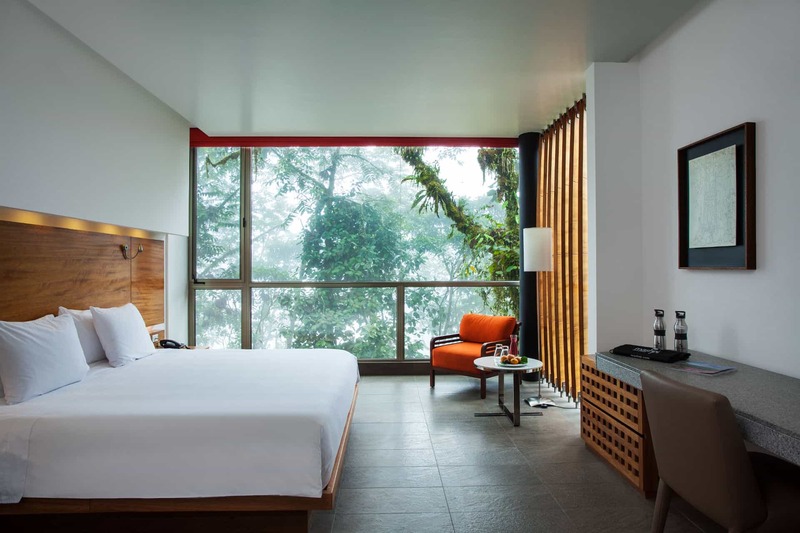 Mashpi is designed to completely immerse you in the world of the surrounding forest, serving as a luxurious retreat in the middle of dense flora, delightful fauna and stunning views. The lodge’s rooms are spread out across three different floors, all of them designed with floor-to-ceiling windows. WITH TRUNKS, BRANCHES, VINES, LEAVES, BIRDS AND SWIRLING CLOUDS ALL AROUND. It’s a bit like being in a crystal capsule, observing the forest life from the comfort of your bed. Open the window and the calls of the birds and croaks of the frogs soothingly wash over you. 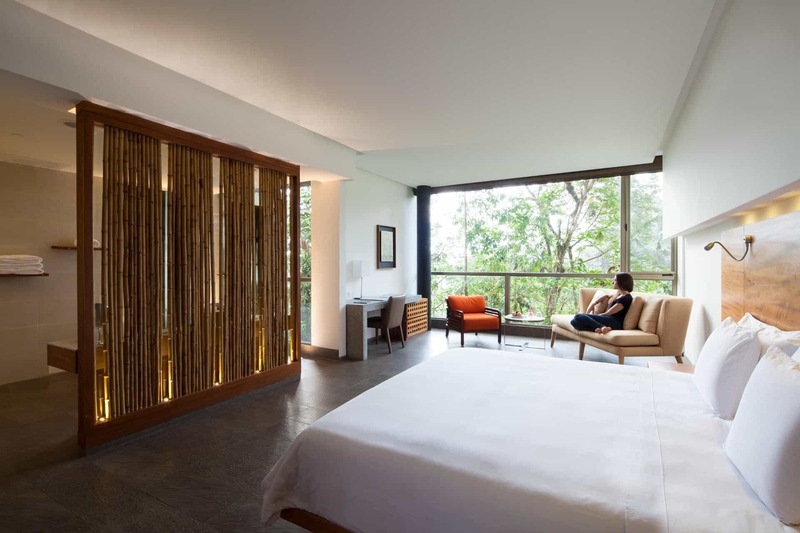 The rooms’ subdued lighting (LED lights are hidden behind the elegant wooden headboards) provide a magical touch, while automatic blinds can be lowered or raised to adjust natural lighting levels. The lodge’s three Yaku Suites (Yaku is a Kichwa word meaning “Water”) extend over an expansive 46 square meters (495 square feet). They are located on the first floor, at the lodge’s northwestern end. Each one features a large bathroom with twin washbasins and Philippe Starck-designed bathtubs-with-a-view. All of our Yaku Suites have king-size beds. The 20 Wayra rooms (Wayra is a Kichwa word which means “wind”) all cover a generous 34 square meters (366 square feet). 13 Wayra Twin Rooms have two full-size beds, with three rooms located at the end of the northwestern wing and the rest along the southeastern wing. 7 Wayra King Rooms out of the 20 rooms feature king-size beds.